I happen to reveal a stretch of country side on the outskirts of Chennai between Tiruporur and Echoor, an adjacent area to the west of OMR that met with Mamallapuram. We took this route esp. 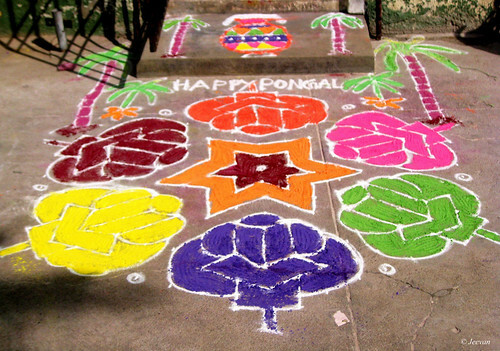 to avoid the Kaanum Pongal rush and also celebrating the closing day of the festival seasons of Pongal by going out with family which is a practice hold by many. This stretch has villages that still breathing the fresh air of vast paddy fields and reserve forest with many Eucalyptus trees where the village cattle’s grazing and the spread of broken glasses and water packets prove it’s a haven for boozers. 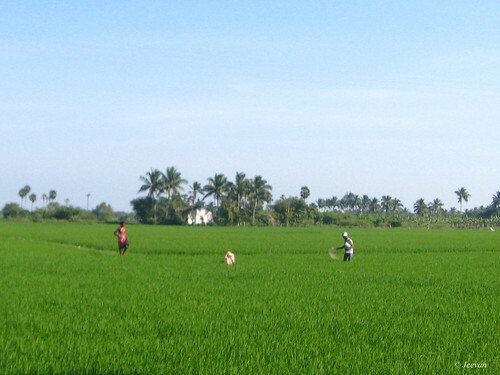 The notable and feel so good was the process of farming and the fragrance that lift in air from the paddy fields and small irrigational canals with clean water. 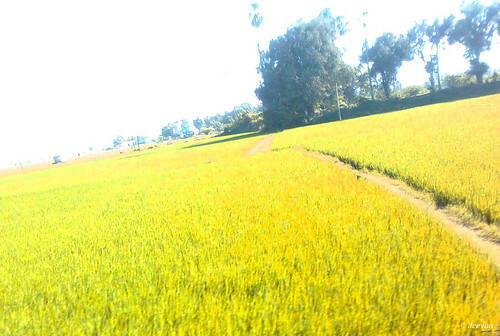 At some places the paddy crops has grown well into golden green colors and were suppose to harvest. When machines have entered at large in farming these days, it’s wonderful to see small scale farmers who can’t afford tractors plowing with oxen and this is a best way of farming I could say where both the man and animal survives. I really worry about cattle’s losing its footprints slowing from farming as machineries representing their places, I’m sure if this continues in progress instead of natural dung, only chemical and oil substance will remain in soil as well as spoiling out heath. 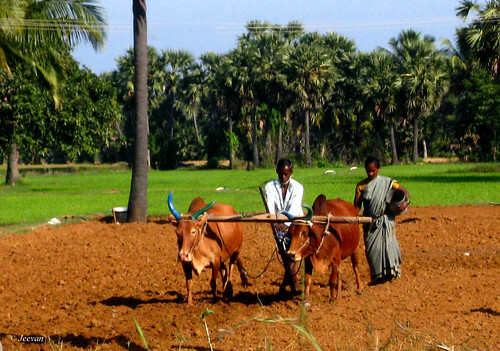 As it was the next day off Mattu Pongal, we could see horn painted bulls and at some villages youngsters were playing at the fields on behalf Pongal holidays, as it is a practice at many villages conducting games following Pongal. This is the time people who left the villages on work basis gather to play games and cherish the moment with friends and families. Kanum Pongal has been well preserved this time and there were rows of vehicles and some open top arrived to celebrate the last day of pongal with lot of noise but we went quiet across the countryside and felt so nice. Nanban has brought back families to theater and I could see a certain amount of people to be parked their vehicles next to another after long time to send us to back row from our usual parking in drive-in. I try to recollect when I watched a quite entertainment movie and obviously could not come to a conclusion as it is very long time after Vasool Raja MBBS and I’m sure Nanban will stay in touch for long time in memories and as long friendship is there. The appreciation should go to the 3 Idiots who impressed the grandmaster Shanker to remake it for Tamil audients to go by emotionally touching their hearts to go with their feeling and reverberating heartbeats. The movie bears the message of all is well by massaging our hearts to make it relief whether from hypertension or stress by their laughter blaster treatment and with so much positive energies to cherish. Being a fan of Vijay once, I hated him alike many on his indifferent and annoy way of acting latterly in movies, but this one wants me to take chance to renewal his fanfare and so was his acting. Absolutely wonderful and charming! I need to say; Sathyan topped the list by making laughter to core and wonder with his performance. His voice modulation has added an aspect to his character to do well. First I wasn’t favorable with Srikanth’s look but he proves with his insight than being gracious but now couldn’t think of another one in his role and Jiiva done his best. Virus, called by students on Sathyaraj does fairness to his sneering dean character, and this villathi villain isn’t indifferent in expressing his scorn and Ileana as his daughter is very lean alike her name and cute in expression and sweet as sauce. The BGM was beautiful... and songs are energetic, esp. the song on friendship and the single string solo is fabulous. Nalla Nanban is my favorite one and overcoming the feeling it causes isn’t an instant and its one best rendering about friendship. To remind the movie is made by Shanker, the grandness is touched at least by couple of songs represent the bold and beautifully and at many places the focus has been keep on Ileana’s lean hip. All is well! Nanban is a best feature on friendship. Don’t miss the fun and heartwarming feel of friendship. The poem came as an inspiration via annoy of watching the skincare advertisements on television, where dusk girls become so bright and white in color in seconds which i feel quite fake and its only girls who own white skin is possible. I change the channel if any skincare ads come on and not alone skincare, the eye-care and haircare. The photo was captured from the-week magazine, long ago, and the girl in the picture naming Neha Sargam looked very cute and impressed me to capture through macro. 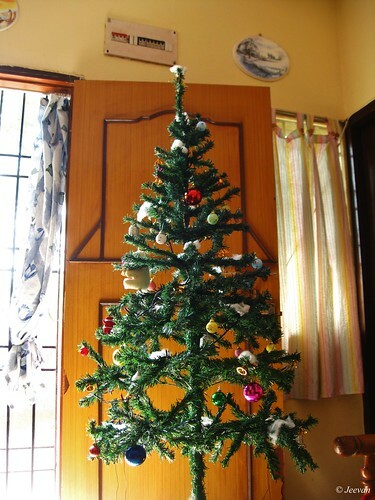 Christmas is the initial of the festival seasons of winter followed by New Year, Pongal and yet to come Republic Day and it’s always pleasure celebrating a festival whichever way it was. Whatever the belief believed beyond any festival at its edge is happiness and it comes as a break from the busy scheduled life of everyone on behalf are suppose to take this chance to get-together with family and friends to rejoice the eve. 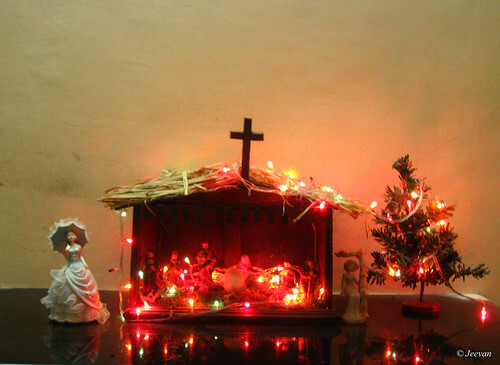 I quite disappointed with the way holidays and festivals are celebrated today in front of televisions and no one is willing to go out by joining with others to make the merry joy into rejoice and it’s disturbing to see some seeking benefit for just being happy and make others feel alike. I feel that we are lost from the path of tradition that quite harvest the happiness and thanksgiving is something we all need to think about others who are behind us being a force to push ahead. There was a time eagerly waiting for the festival greetings via post from our dear ones far away and what our technology has done today in communication is simplify to the least, but lost to touch the heart of everyone. The words have become shot and sweet but their relationships have become lack of savor and the significant of talk or text have come to least when there is plenty of ways to communicate. There used to say that each individual is united as society but what’s happening these days are the individuals becoming more individual to think a lot about themselves alone and only the last though is given to society . We aren’t to blame anyone since the individual growth is rising to summit and standing on their foot doesn’t care much for others... and so the gap increased between relationships has created the distance to share the joy. Hope u all enjoyed the festival season! happiness is invited into their homes. 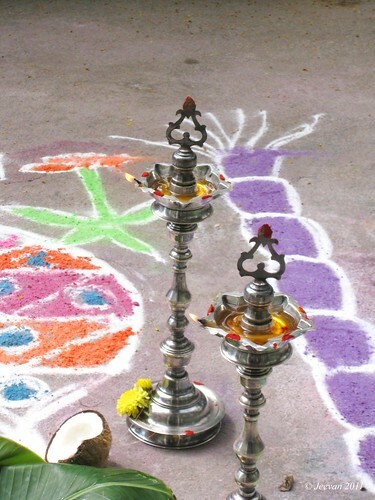 The silver brass lamp were shot from last year's pongal festival at home. 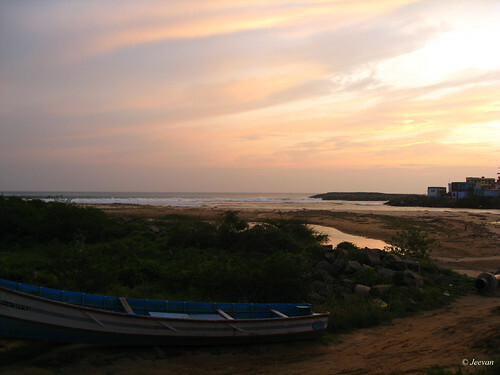 Drive by 8km from Kanyakumari, Manakudy is parted as Mel and Keezha Manakudy which is separated by the river Pazhayar that span like a lake here, merges with the sea. Manakudy is one of the worst affected areas in Kanyakumari by the 2004 tsunami which swept away many lives and things from here, and with one of them we talked from here says the bridge that was connected the hamlets was washed away by tsunami to 500 meters into the river and pulled back into the sea. It’s said the bridge that was made of four concrete pieces, each weighted 400 tones was washed away except for the two pieces that pushed to remain on both ends of the river. 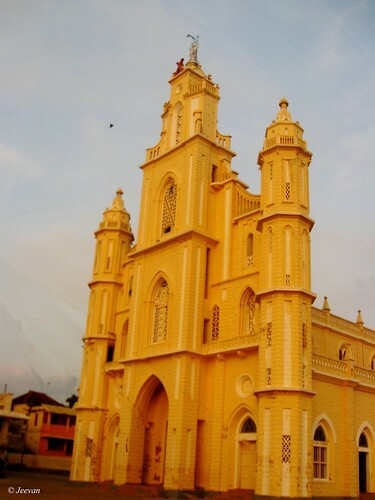 What attract me in Manakudy were the two churches each built on Mel and Keezha Manakudy which comprises the old and new and both are attracted by their colors of pale while and yellow along the spellbind architecture. The St. Andrew’s Church painted in pale yellow is very old and closes to shore, and because of this the Church glows to golden orange in evening while sunsets on the sea. 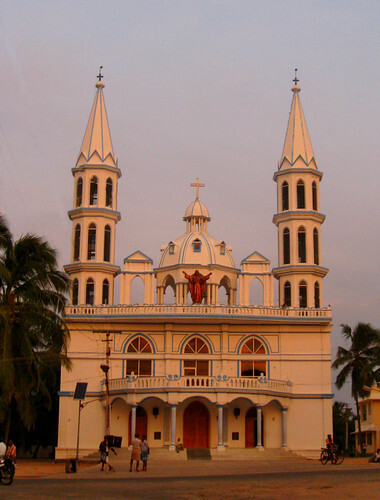 The Keezha Manakudy church is a newly built holy cross church, flashes in white and easily catches the attention. The Mel and Keezha Manakudy are connected by a temporally built small iron bridge that contain to pass MPV and the view from here was wonderful to see the waves rushing into the river and far away mountains and newly constructing bridge on the lake opposite. 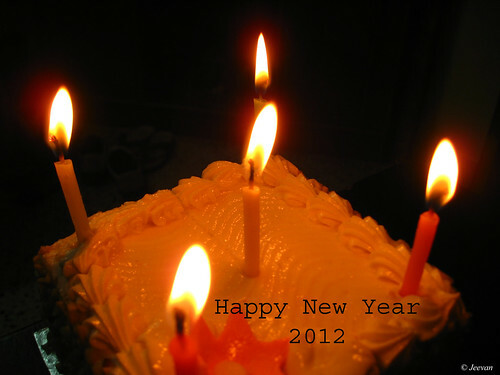 Hope it was a wonderful beginning for every one of you this year and it’s been two weeks since I posted something and I was almost away from online and because of cold and cousins visiting home and laptop problem I couldn’t get interest to post anything even got chances to do. 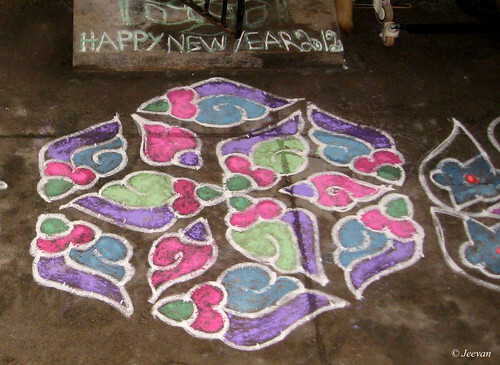 The New Year eve went off peacefully and pleasantly at home through cutting cake at mid-night and tuning songs to share the joy and calling some dear ones on their asleep… parents did a visit to our street end Pillaiyar temple for the mid-night special worship, and it dawned for us between the crackers sound and kids screaming a lot at neighbor, wishing happy new year. The news channels helped in understanding the joy across the country by reporting from every city’s hub about the ongoing celebration and this time we get to realize the new year eve was partially joy since it was the second day of the Thane cyclone that unturned the Puducherry and Cuddalore district to immense destruction. First time we get to see the terrific face of the cyclone and thanks to the media that reporting every aspect of the cyclone and its devastation from time to time and understanding its progress that sent almost trees to fall in this district which had been the major hub for cashew and jack fruit cultivation which is internationally renowned for these. We can’t take it easily when people says that almost trees of cashew and jack fruit lost their places and it will take minimum 15 year to begin its next cultivation if the trees are replaced by plants now. I had been to both these places and know the wealth of the greenery and one can smell the fragrance of cashew nuts frying once across the Panruti in Cuddalore district and in decades this is the first time a strong storm windblown and make people feels that tsunami is better than cyclone that it only affects life that close to shore but cyclone strikes across the land and goes interior until it gets weak. The Thane also left it foot prints on Chennai’s shores creating transparent changes at the beach fronts; where waves pulled in and throwing away the sands makes it feel minimize in distance between sea and the shore. The night before cyclone crosses ashore, the wind was blowing very strong here like unlike before and we were kept checking news often the day and night on its progress. The cyclone also reminded the tsunami to too many as both the disasters happened at same period of the year-end; we all wish the New Year brings new hope to those affected by cyclone and restore back to normality soon. But the immense lose of trees is inconsolable… in the era of planting more trees to restore the environment this tragedy has increased the burden.